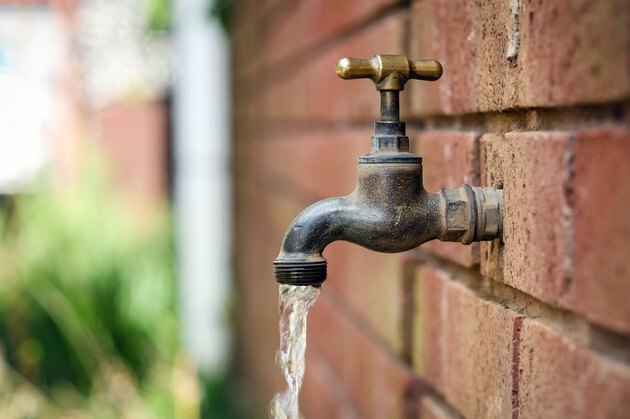 Your outdoor spigot and hose get a workout during the summer months, but when the temperatures drop, that outdoor faucet can cause pipes to freeze. One way to cut down on the risk of a burst pipe is to install a frost-free hose bib on your home's exterior. They're also called freeze-proof, and they go by the names faucet, spigot, sillcock and house bib. The design and installation of this special faucet minimizes the chances of water freezing inside the spigot. If you're thinking of installing a frost-free hose bib, letting a professional plumber handle the work reduces the risk of leaks or improper installation. Find a local plumber who is experienced in the installation of freeze-proof spigots to ensure everything gets installed at the correct angle with leak-proof connections inside your home. When evaluating potential plumbers, call them to ask about their experience with this type of project. On the outside, a frost-free faucet looks the same as a traditional faucet, but the parts inside the home are different. On a frost-free model, the pipe that goes inside the house is longer than a traditional faucet, with the shutoff valve sitting further inside the house where it's warmer. When installed properly, the pipe rests at a slight downward angle to help any water drain out so it doesn't freeze. Traditional hose bibs feature the shutoff valve right behind the handle. When you shut off the water on a frost-free faucet, the water stops behind the valve, which is set further back inside the home. This means the water won't freeze because it stays where the interior air temperature is warmer. Because water left in the outer portion of the pipe drains to the outside, there's nothing left to freeze and cause pressure in the pipes. The freeze-proof faucet has a handle and spout outside the home like any spigot. That connects to a long pipe, which has a shutoff valve or stop valve at the other end. The pipe is usually at least 4 inches long and sometimes longer to reach far enough into the home to keep the water in warm temperatures. Many frost-proof hose bibs have vacuum breakers, also called anti-siphon devices. This device stops water from being sucked from your hose back into your water system, where unsanitary hose water can contaminate your water. Proper installation means the faucet should angle down slightly to let water run out of the pipe. When replacing an old faucet, you first need to use a pipe wrench to remove the old spigot. Depending on the size of the new sillcock, you may need to enlarge the hole to accommodate a larger pipe. You can then insert the new sillcock with the downward angle positioning. The next part of the job is attaching the frost-free spigot to the plumbing. That often involves adding short pieces of pipe and new fittings to properly connect. If you don't want to mess with soldering the fittings together, consider using push-in fittings such as SharkBite, which are quick to install with no soldering required. Just installing a frost-free spigot may not be enough to prevent freezing. Proper fall maintenance on your outdoor faucet also helps minimize potential damage. You still want to remove the hose in the fall to allow water to flow freely out of the pipe. Water trapped in the faucet freezes, with that ice potentially working its way further into the pipe and causing pressure, which can make a pipe burst. It's also important to have a long enough pipe to keep the valve in warm temperatures. Adding insulation to the wall or sealing around the hole for the faucet can help keep the area warmer, which reduces the risk of freezing.